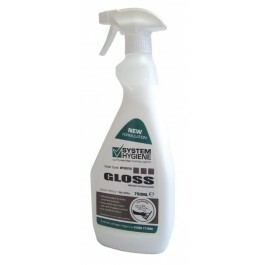 System Hygiene Gloss liquid furniture polish effectively cleans and shines most hard surfaces. It will clean and polish a variety of surfaces and leave a deep, long lasting shine. It is suitable for use on wood, veneer, laminates, stainless steel, formica, glass, chrome, paintwork, telephones, VDU's and TV screens. High quality liquid polish for use on a variety of surfaces. Leaves a fresh and pleasant fragrance. Use undiluted. Spray polish onto a clean, soft cloth and apply to the desired surface, buff to a shine. Not suitable for polishing floors.